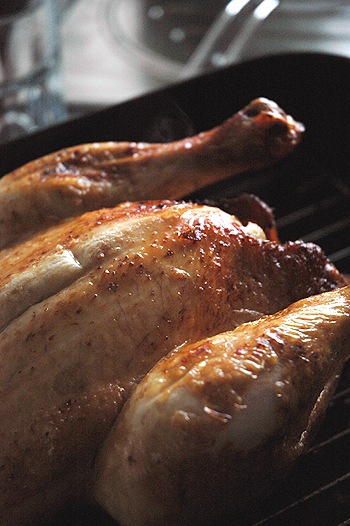 I started this blog with a post about roasting a chicken. I was naïve and young and thought I could change the world, or at least the way the world roasted her chicken on a Sunday. Since then I have learnt restraint and a to consider the roasting of a chicken in a more holistic, a calmer altogether more inclusive way. Or something like that. I basically figured out as there is more than one way to skin a cat, there are a million ways to roast a chicken, though I have a hard time trying to figure out why you’d want to find more than one way to skin a cat, or even one way to skin a cat for that matter, whilst roasting chicken remains something of a favourite thing to do of a weekend for me. Upside down? Turning every 20 minutes? With the potatoes? On a stand? In a pot? With foil? Basting? Stuff under the skin? Olive oil or butter? Massage or drizzle? 220 degrees for three quarters of an hour? 190 degrees for an hour? 75 degrees for 4 hours or just sit on it for a week? It seems it is very easy to get this very simple dish very over complicated in a very short amount of time and it got me thinking what is it we are after? Something that tastes of chicken? Well, seemingly everything does that, though that’s more indicative of how we perceive chicken these days than the taste itself. Since it is such a default meat, we seem to have assigned it a default meat flavour. Something warm, vaguely meaty and quite tender. Which is why everything tastes’s of it, since any other meat probably has these qualities if cooked long and hard enough. I had some crocodile whilst in Sydney and, yes, it did taste a bit like default chicken, but chicken crossed with a fish, a watery slightly iodine tang, which is exactly how I imagined a reptile to taste, but as far away from what a chicken should taste like as you are likely to get. What should a chicken taste like? Deeply savoury, moist silken meat. A salty crackle of skin, a subtle gameyness, a sweetness and the faintest hint of smoke. How do you get there from the raw state? For me, good meat and the lightest of touches when it comes to preparing it. A liitle oil, a rub of garlic, salt and pepper. Roast. I'm so dissapointed in the taste of even the "good" chickens here. I'm thinking of trying one from the Mexican butcher next.